"WP:CON" redirects here; you may be looking for WP:Conflict of interest, Help:Edit conflict, WikiConvention/Conference or WP:WikiProject Containers. This page in a nutshell: Consensus is Wikipedia's fundamental model for editorial decision making, and is marked by addressing legitimate concerns held by editors through a process of compromise while following Wikipedia policies. Decisions on Wikipedia are primarily made by consensus, which is accepted as the best method to achieve Wikipedia's goals, i.e., the five pillars. Consensus on Wikipedia does not mean unanimity (which is ideal but not always achievable), neither is it the result of a vote. Decision making and reaching consensus involve an effort to incorporate all editors' legitimate concerns, while respecting Wikipedia's policies and guidelines. This policy describes how consensus is understood on Wikipedia, how to determine whether it has been achieved (and how to proceed if it has not), and describes exceptions to the principle that all decisions are made by consensus. A consensus decision takes into account all of the proper concerns raised. Ideally, it arrives with an absence of objections, but often we must settle for as wide an agreement as can be reached. When there is no wide agreement, consensus-building involves adapting the proposal to bring in dissenters without losing those who accepted the initial proposal. Consensus is a normal and usually implicit and invisible process across Wikipedia. Any edit that is not disputed or reverted by another editor can be assumed to have consensus. Should that edit later be revised by another editor without dispute, it can be assumed that a new consensus has been reached. In this way, the encyclopedia is gradually added to and improved over time. All edits should be explained (unless the reason for them is obvious)—either by clear edit summaries indicating the reason why the change was made, or by discussion on the associated talk page. Substantive, informative edit summaries indicate what issues need to be addressed in subsequent efforts to reach consensus. Edit summaries are especially important when reverting another editor's good faith work. Repeated reversions are contrary to Wikipedia policy under Edit warring, except for specific policy-based material (such as WP:BLP exceptions) and for reversions of vandalism. Except in cases affected by content policies or guidelines, most disputes over content may be resolved through minor changes rather than taking an all-or-nothing position. Often, a simple rewording will satisfy all editors' concerns. Whether changes come through editing or through discussion, the encyclopedia is best improved through collaboration and consensus, not through combat and capitulation. Be bold, but not rash. In most cases, the first thing to try is an edit to the page, and sometimes making such an edit will resolve a dispute. Use clear edit summaries that explain the purpose of the edit. If the edit is reverted, try making a compromise edit that addresses the other editors' concerns. Edit summaries are useful, but do not try to discuss disputes across multiple edit summaries; that is generally viewed as edit warring and may incur sanctions. If an edit is reverted and further edits seem likely to meet the same fate, create a new section on the associated talk page to discuss the issue. When agreement cannot be reached through editing alone, the consensus-forming process becomes more explicit: editors open a section on the associated talk page and try to work out the dispute through discussion. Here editors try to persuade others, using reasons based in policy, sources, and common sense; they can also suggest alternative solutions or compromises that may satisfy all concerns. The result might be an agreement that does not satisfy anyone completely, but that all recognize as a reasonable solution. Consensus is an ongoing process on Wikipedia; it is often better to accept a less-than-perfect compromise—with the understanding that the page is gradually improving—than to try to fight to implement a particular preferred version immediately. The quality of articles with combative editors is, as a rule, far lower than that of articles where editors take a longer view. When editors have a particularly difficult time reaching a consensus, several processes are available for consensus-building (third opinions, dispute resolution noticeboard, requests for comment), and even more extreme processes that will take authoritative steps to end the dispute (administrator intervention, arbitration). Keep in mind, however, that administrators are primarily concerned with policy and editor behavior and will not decide content issues authoritatively. They may block editors for behaviors that interfere with the consensus process (such as edit-warring, abuse of multiple accounts, or a lack of civility). They may also make decisions about whether edits are or are not allowable under policy, but will not usually go beyond such actions. Editors who maintain a neutral, detached, and civil attitude can usually reach consensus on an article through the process described above. They may still occasionally find themselves at an impasse, either because they cannot find rational grounds to settle a dispute or because one or both sides of the discussion become emotionally or ideologically invested in winning an argument. What follows are suggestions for resolving intractable disputes, along with descriptions of several formal and informal processes that may help. In determining consensus, consider the quality of the arguments, the history of how they came about, the objections of those who disagree, and existing policies and guidelines. The quality of an argument is more important than whether it represents a minority or a majority view. The arguments "I just don't like it" and "I just like it" usually carry no weight whatsoever. Limit article talk page discussions to discussion of sources, article focus, and policy. If an edit is challenged, or is likely to be challenged, editors should use talk pages to explain why an addition, change, or removal improves the article, and hence the encyclopedia. Consensus can be assumed if no editors object to a change. Editors who ignore talk page discussions yet continue to edit in or revert disputed material, or who stonewall discussions, may be guilty of disruptive editing and incur sanctions. Consensus cannot always be assumed simply because editors stop responding to talk page discussions in which they have already participated. A neutral third party will give non-binding advice on the dispute. Reserved for cases where exactly two editors are in dispute. Most policy and guideline pages, and many wikiprojects, have noticeboards for interested editors. Posting neutrally worded notice of the dispute on applicable noticeboards will make the dispute more visible to other editors who may have worthwhile opinions. For disputes involving more than two parties, moderators help the parties come to consensus by suggesting analysis, critiques, compromises, or mediation, but generally limited to simple disputes which can quickly be resolved. As noted previously, policy pages generally have noticeboards, and many administrators watch them. The final step for intractable disputes. The Arbitration Committee (ArbCom) may rule on almost any behaviorial or policy-interpretation aspect of a dispute, and has broad powers in its decisions. ArbCom does not settle content disputes or change policy. Off-wiki discussions. Consensus is reached through on-wiki discussion or by editing. Discussions elsewhere are not taken into account. In some cases, such off-wiki communication may generate suspicion and mistrust. Canvassing, sock puppetry, and meat puppetry. Any effort to gather participants to a community discussion that has the effect of biasing that discussion is unacceptable. While it is fine—even encouraged—to invite people into a discussion to obtain new insights and arguments, it is not acceptable to invite only people favorable to a particular point of view, or to invite people in a way that will prejudice their opinions on the matter. Using an alternative persona ("sock puppet", or "sock") to influence consensus is absolutely forbidden. Neutral, informative messages to Wikipedia noticeboards, wikiprojects, or editors are permitted; but actions that could reasonably be interpreted as an attempt to "stuff the ballot box" or otherwise compromise the consensus-building process are considered disruptive. Forum shopping, admin shopping, and spin-doctoring. Raising essentially the same issue on multiple noticeboards and talk pages, or to multiple administrators or reviewers, or any one of these repetitively, is unhelpful to finding and achieving consensus. It does not help develop consensus to try different forums in the hope of finding one where you get the answer you want. (This is also known as "asking the other parent".) Queries placed on noticeboards and talk pages should be phrased as neutrally as possible, in order to get uninvolved and neutral additional opinions. Where multiple issues do exist, then the raising of the individual issues on the correct pages may be reasonable, but in that case it is normally best to give links to show where else you have raised the question. Consensus is ascertained by the quality of the arguments given on the various sides of an issue, as viewed through the lens of Wikipedia policy. Consensus among a limited group of editors, at one place and time, cannot override community consensus on a wider scale. For instance, unless they can convince the broader community that such action is right, participants in a WikiProject cannot decide that some generally accepted policy or guideline does not apply to articles within its scope. WikiProject advice pages, how-to and information pages, and template documentation pages have not formally been approved by the community through the policy and guideline proposal process, thus have no more status than an essay. Wikipedia has a standard of participation and consensus for changes to policies and guidelines. Their stability and consistency are important to the community. Accordingly, editors often propose substantive changes on the talk page first to permit discussion before implementing the change. Bold changes are rarely welcome on policy pages. Improvements to policy are best made slowly and conservatively, with active efforts to seek out input and agreement from others. In deletion discussions, a lack of consensus normally results in the article, page, image, or other content being kept. "If it has never been stable, or it has been unstable for a long time, and no consensus can be reached on what the title should be, default to the title used by the first major contributor after the article ceased to be a stub." 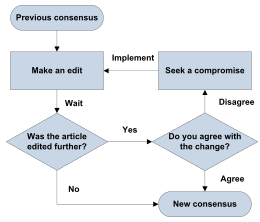 Editors may propose a consensus change by discussion or editing. That said, in most cases, an editor who knows a proposed change will modify a matter resolved by past discussion should propose that change by discussion. Editors who revert a change proposed by an edit should generally avoid terse explanations (such as "against consensus") which provide little guidance to the proposing editor (or, if you do use such terse explanations, it is helpful to also include a link to the discussion where the consensus was formed). Some matters that may seem subject to the consensus of the community at the English-language Wikipedia (en.wikipedia.org) are in a separate domain. In particular, the community of MediaWiki software developers, including both paid Wikimedia Foundation staff and volunteers, and the sister wikis, are largely separate entities. These independent, co-equal communities operate however they deem necessary or appropriate, such as adding, removing, or changing software features (see meta:Limits to configuration changes), or accepting or rejecting some contributions, even if their actions are not endorsed by editors here. This does not constitute an exhaustive list as much as a reminder that the decisions taken under this project apply only to the workings of the self-governing community of English Wikipedia.